A great instructional tool for children, particularly those with attention deficit hyperactivity disorder, a "T stool" is also a very simple item to build at home. Older children may even be able to assist in building the stool, instilling both pride and a sense of ownership. While particular care should be taken in picking out and preparing any wood or other materials to be used, all the items needed can be easily obtained in home repair stores or purchased over the Internet. Remove the metal band from the pipe cap. Place the wood dowel in the vice and drill a 1/4-inch hole through the center 1 1/2 inches from one end, then three more every 1 1/2 inches. Place the PVC pipe in the vice and drill a 1/4-inch hole through the center 2 1/2 inches from one end. Install the hanger bolt in the wood dowel on the end furthest from the drilled holes. Drill a 7/16-inch hole in the center of the 3-by-3 piece of particleboard and install the tee nut. If your tee nut has screws with it, screw it into place. If it has prongs, push it through the hole as far as it will go. Place the 3-by-3 board in the center of the 9-by-5 board, with the tee nut sandwiched between, and screw the smaller board to the larger board with the wood screws. Screw the dowel and hanger bolt assembly into the tee nut hole in the 3-by-3 board. 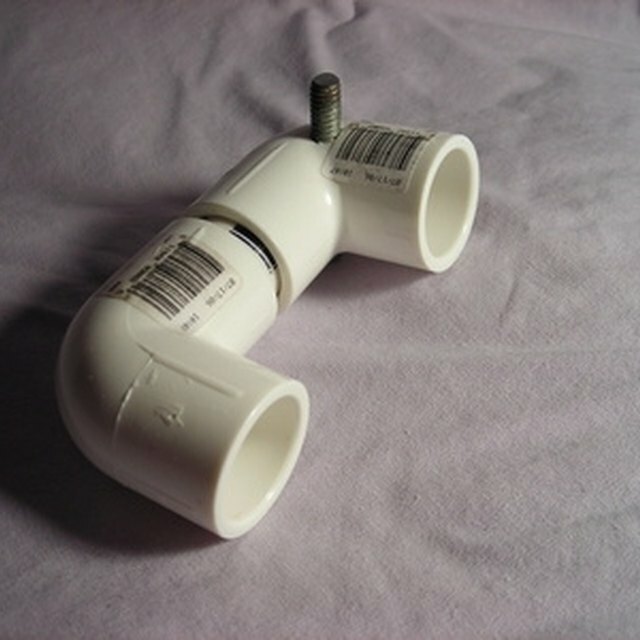 Push the pipe cap onto the end of the PVC pipe furthest from the drilled hole. Insert the wood dowel into the PVC pipe and line-up the drilled holes. If you cannot line-up the holes, double check Step 4 in this and the prior Section. Insert the cotterless hitch pin or wire lock pin through the holes to hold the stool together. Use the pin and additional holes to adjust the height of the stool. Use sandpaper to clean-up any edges and holes before allowing a child to use, taking special care if you substitute other wood for particle board. For easy transport, simply unscrew the wood dowel from the seat, and the component parts easily fit a backpack and are simple to re-assemble. Plywood is seriously discouraged as a material for this stool. Benjamin Kibbey began as a U.S. Army photojournalist in 2002 and took on the additional duties of editing in 2005. He has been published in various newspapers and websites such as GlobalSecurity.org. Kibbey has a Bachelor of Arts in news writing and editing, with a specialization in English, from the E.W. Scripps School of Journalism at Ohio University.